A fire on the top floor of a Paris skyscraper has been put out. The Coeur Defense office complex in the west of the French capital was on fire for around an hour, with smoke bellowing out from the roof. No casualties have been reported. Fire fighters quickly arrived on the scene to tackle the blaze at the building, which started at around 10am local time. 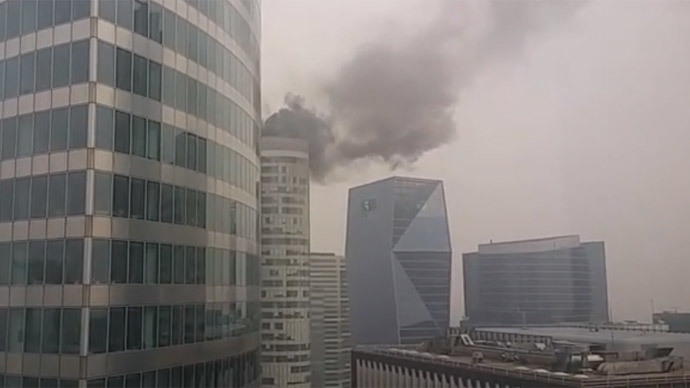 Speaking to RT, the Business Quarter La Defense communication director Herve Bonnat said the fire began in the ventilation system. He added that it was a minor incident and it posed no threat to anyone in the building. Around 150 workers were evacuated from the top two floors of the building as a precaution, however they have all returned to work, Yvon Bot, press secretary of the Paris Fire Brigade said. A journalist from radio station France Bleu said the fire seemed to be more spectacular than it was serious. The reporter added that the cause of the blaze is believed to be a generator that caught fire on the roof. Incendie à #Coeurdéfense nous avons été évacués. The complex consists of around 10 towers, while the oil company Total has offices within the buildings, as do a number of banks and insurance companies. Bought by the Lone Star Real Estate Fund in 2014, the complex was partly financed by Lehman Brothers; however the bank went bust in 2008, which led to the building’s owners filing for protection from creditors in France. The towers are 40 stories high and with 350,000 square meters of office space, it is the largest office building in Europe.